Sometimes the simplest toys are providing the most fun. In my family, almost all children for generations had a pull duck made out of wood that we happily took on walks. This simply duck by HABA is one that I have bought for my friends' kids and they love it. It makes the walks more fun, especially when the older sibling can pull the duck along, while the mom is pushing the stroller. This makes the kid feel more adult and also encourages them to walk, which is important. 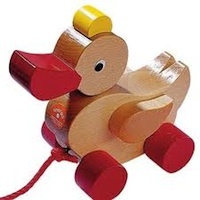 I like this duck because it is made out of real wood, does not make any annoying noises, allowing the parent to talk to their child on the walk and the materials used are safe and chemical free - truly made with a child touching and biting in mind.